"'perfectly valid reasons' were things like"
someone else filled in the details for you, if you look above there is a list of things kwin does right today that beryl/compiz doesn't. i try not to spend more than a minute or two writing replies here, so apologies for not being more thorough. "I REALLY doubt it would be anywhere near as hard as duplicating that much of Beryl's functionality was"
well, it is. in part because the proper window management takes a -lot- of testing under all kinds of conditions and compositing tech is far more self-contained of a problem space: it either works or it doesn't. neither is trivial, but one is faster to get through. the work compiz/beryl have done also shows the way quite nicely; they deserve massive kudos for that. we have a known good solution that our userbase absolutely relies on. beryl/compiz doesn't work for the entirety, majority even, of that user base. ergo the chosen solution. btw, this isn't a kde thing. metacity is doing the same thing and, as i understand it, for the same reasons. Yea! There's only one window manager needed! Oh - even more! There's only one desktop environment needed! And - uh! Oh! We only need one operating system! So why don't we all use Windows? Why do people waste resources by making OSX, BSD, Linux, Symbian, ...? Maybe competition and choice is a good thing? Maybe without competition there wouldn't be evolution (see Windows Vista as an example). > We only need one operating system! So why don't we all use Windows? The "don't duplicate efforts" principle is only valid in the Free Software world. Does that answer your question? The only answer to this kind of absurd post is: go, buy a Mac and use the one and only OSX+Apple HW. You won't bother (or brotherr? ROTFL) anymore about fragmentation. And anyway, if you really wnat to blame someone for creating "fragmentation", blame the author of compiz who started a new WM and not implemented it in KWin or Metacity (since it was a Novell employee). Well thank you for the education on these issues. I do not know where I stand now. I do not think my concerns for what is best for the desktop are lessened but you all do make great points. The simple point is: Compiz was a research project. It is now indeed duplicating stuff found in current windowmanagers, but that's THEIR waste of time. The lack of a plugin infrastructure in compiz makes it impossible to directly re-use their plugins (though we can and do port code and ideas from them). And windowmanagment is much larger than compositing, so it makes more sense to add compositing to a windowmanager than a windowmanager to a compositor. What do you suggest? That people shouldn't work on what they prefer to work on in their freetime? Choice is one of the great things in regards to open source. Great. How about adding standard behavior? Re: Great. How about adding standard behavior? You can disable window decorations in Window menu (Alt+F3) sub-menu Advanced. Thank you. I had no idea that Special Window Settings dialog existed. I use Plstik window decorations and it really maximalizes windows. Same with baghira. No border, also with konqueror. a) the window decoration needs to "get out of the way" on maximized windows. most window deco themes do this now. c) the application needs to avoid adding internal borders/frames at the window edges that get in the way. there is nothing the window manager can do about this one. and (c) is what you are running into. the tab widget in qt3 has a real problem here where it insists on putting a border there. so you're right that kwin can't do this, but that's because kwin, or any other wm, can't. With Konqueror you can press Ctrl+Shift+F to make it fullscreen without borders. I think what you are asking for is a way to reach the fourth state. Well, the window menu, in the "advanced" submenu, has a "full-screen" option. I set up a shortcut for that (alt-enter - there's no default shortcut, however). One way to set up a shortcut is in the kde control center, region and accessibility -> keyboard shortcuts. In the first tab (global shortcuts), in the "windows" group you have the "full screen" entry. (By the way, don't say "one thing kwin cannot do" when that's not true, at least add a "I think"). and de-select 'Allow moving and resizing of maximised windows'. There, wasn't too hard, was it? No matter what you do you (disable "Allow moving and..." or F11 fullscreen) you still end up with a couple of pixels right to the scrollbar. You should be able to just move the cursor to the right edge of the screen to use the scrollbar. Right now, this is not possible. Not exactly. On Kubuntu with Baghira as decoration, my Konqueror have no such burder, if he is maximized. Only in 'normal' mode, there is such a border. Here is a little Screenshot of a maximized Konqueror (the active window in the back) and a normal Konqueror (the little window in front). As you can see, there is no border beside the scrollbar of the maximized window, but a gray at the small window. kwin is bad for drag & drop! 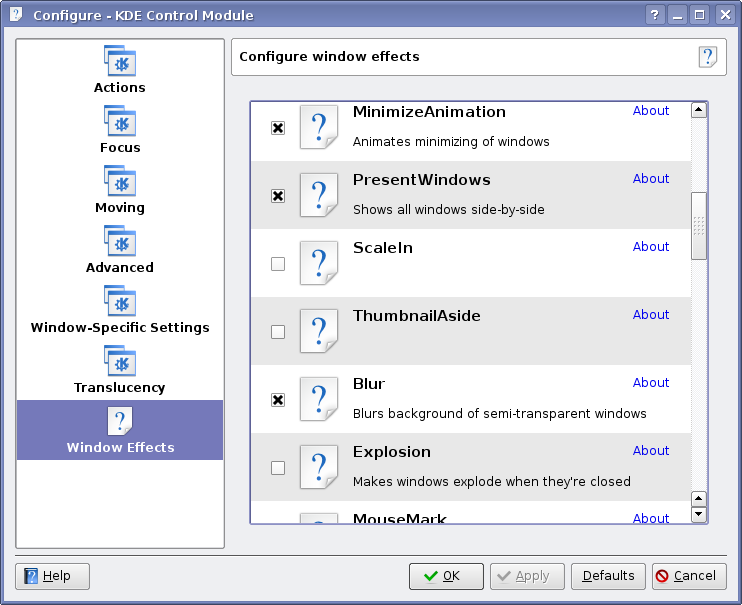 Although KDE support d&d (drag and drop) but KWin fails KDE applications by making it impossible to do drag&drop. because the focus changes to the window as soon as the mouse button is pressed (clicked and held), which makes it impossible to do drag and drop in KDE. whereas, in windows, when the user releases the mouse button only then the "focus" shifts to the window. 4. but do not maximize it. 5. Now, try dragging a file from the "maximized" first window to the "unmaximized" second window. 6. as soon as you click on the file in the maximized window the focus is given there and lo and behold! your whole idea of drag&drop is destroyed. fixable.. just use "release to focus" instead of "click to focus." Will KDE 4 really support d&d which works??? Re: kwin is bad for drag & drop! > fixable.. just use "release to focus" instead of "click to focus." With KDE 3.5, there is some advanced configuration for this things. I does'nt the English name for modul, but it must be something like 'windowattributes', where you can also configure the click-behavior. But I think it should be amended: "focus on release + focus on hold for more that 5 seconds" so I can still get a window to the front where I have some folder below my current window. This kind of drag and drop works with tabs in Konqueror, which has a nice smart behaviour if you drag an item over the tab, so it works as expected. It's also less work (e.g. to manage the windows) than having multiple windows. Sadly, the developers are reluctant to implement these tabs known from Konqueror in Dolphin. As soon as I click on a window, I expect it to be active and on the top. So that's exactly the behaviour I'd expect. hehe, that's exactly what my self-created taskdock do. I think with kde4 and plasma+kross, there will come a huge wave of alternative task bars and docks, because, with scripting-lang this is really easy. - just drop it on the taskbar item (the dock icon). The application opens the file automatically with it's default settings. No need to wait to have the window in focus if you want the default behavior. Yes, event hat I don't use a Mac, this is the expected behavior almost any user would think of at a first time. On my KDE it's possible actually : just try to drag&drop a Konqueror tab to the konqueror icon of your kicker shorcut bar. Another thing i like is that when dragging, you can wait over a task bar item, it will give the focus to the app and you'll be able to drop it where you want. First: Use ALT-TAB to bring on top the window that is behind the maximized one. Second: Drag files to the button of the second windows where you want to drop, but wait a few senconds. The window will pop up and you will be able to drop files. Your problem is not big enoguth to say that KWin makes imposible to drag & drop on KDE, or that the whole idea of drag&drop is destroyed. If you try to drag and drop in this specific way, it doesn't work! Answer: don't do it that way. I sympathize; it took some getting used to, but there are plenty of workarounds suggested. It's certainly not something that should be changed by default. *Maybe* an option somewhere. > If you try to drag and drop in this specific way, it doesn't work! Works fine for me, this way, with the correct configuration, at kde 3.5.7. But, I agree, the config for such a behavior is'nt really useful for daily work. There are workarounds, but the real thing is that this won't ever work - the way X.org works makes it impossible (according to the kwin developers, that is). X have support for this!! and there is an option titled "Inactive inner window - Left button". Change that to "activate & pass click" instead of "activate, raise & pass click". Could someone from here with a youtube account posts some comments? I just saw the wavy-windows effect (via youtube-dl and mplayer) and I rather liked it, since it would make a great screensaver. Many of the people there seem to just think "not what I know" or "doesn't work for what I want it for, therefore it's useless" or similar, and I think that the videos should get some really fair feedback. In the first screenshot... Why is the "Configure window effects"-field wider than the field (the one with "PresentWindows", "blur" etc.) beneath it? A tiny nitpick, I know, but I think that details like that are quite important (and quite easy to fix). What about KDE theme manager? Hi, I'm very impressed with the progress KDE 4 is making - keep it up! Just wondering about KDM (the theme manager from http://www.kde-apps.org/content/show.php?content=22120) - apparently it is being integrated into KDE 4? What's the latest? Will the theme manager be as easy to use as GNOME's (i.e. drag-and-drop the theme file into the manager and it's ready to go)? How will it interact with kwin_composite and plasma? I really hope theming becomes easier with the next KDE release. Re: What about KDE theme manager? kdm is not a theme manager, its kdes login application. the link you posted is only used to choose a theme for kdm, not kde. also, kde3.5 allready has a theme manager (to be found under appearance and themes in controll center) that makes it possible to to configure desktop-background, colors, widget theme, icons, fonts and the screensaver with one file. so it works exactly like gnome. the only difference is that gnome users tend to produce more "theme-files" than "widget-theme-engines", and kde users do the opposite. because widget-engines are compiled programs, they should be installed by the packagemanager of your distribution. I'd be happy if they just made it easier to configure KDM from the text files. I still haven't been able to get KDM to do multiple sessions on different local X servers. GDM does this quite nicely with a little editing of the config file. Great work Kwin devs and the rest of the KDE4 devs - KDE4 is shaping up to be something quite amazing!